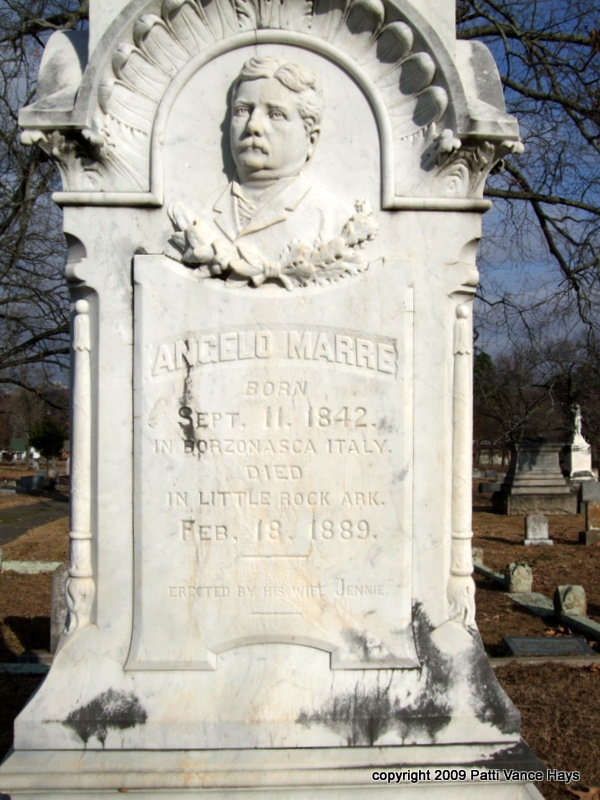 On September 11, 1842, future Little Rock Alderman Angelo Marre was born in Borzonaca, Italy. He immigrated to Tennessee with his parents in 1854. During the Civil War, he served in the Confederate Army. From 1865 to 1868, Angelo Marre worked for the Memphis Police Department but was forced to resign after he was accused of killing a man during an argument. After his acquittal, he returned to the saloon business. In 1872 Marre was convicted of stealing money and sentenced to three years in prison. Tennessee Governor John Brown granted Marre a full pardon two years into his sentence, and he regained his citizenship in 1879. After getting out of prison, he claimed an inheritance and joined his brothers in Little Rock. He worked as a bartender at the Metropolitan Hotel. He later opened a saloon and billiard parlor. By the mid-1880s, Marre owned two saloons, a liquor import business, an office building in downtown LR, 3,000 sharesof stock in mining companies operating in Garland and Montgomery counties, and he was the first president of Edison Electric Company of LR. In 1883, he was elected as an alderman on the Little Rock City Council. He lost is bid for reelection in 1885. In 1888, he was an unsuccessful candidate for Pulaski County Sheriff. Angelo Marre died February 18, 1889, as a result of his infection. He is buried at Calvary Cemetery in LR. His custom designed, marble monument was ordered from Florence, Italy, and cost $5,000. Marre is probably best known today as the builder of the structure now known as the Villa Marre. Built in 1881, it is designed in the Italianate and Second Empire styles. 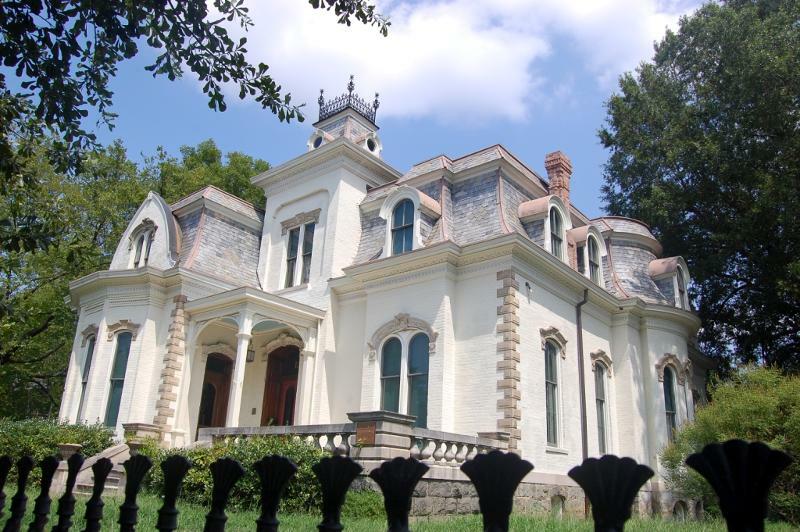 It was built in 1881 and 1882 on Block 21, Lots 5 & 6 of the Original City of Little Rock. The cost was $5,000. It was originally a red brick structure and has been modified and expanded several times as well as painted white. It did not bear the name Villa Marre until the 1960s when historic preservation advocate Jimmy Strawn gave it that name. After serving as the headquarters for the Quapaw Quarter Association for several years, it was returned to a private residence. It is now available for special events and rentals. The Villa Marre is probably best known locally and nationally for serving as the facade for the Sugarbaker design firm on the CBS sitcom “Designing Women.” Though the interior of the house does not match the interior on TV, the building was featured in the opening credits as well as in exterior shots each week. The Villa Marre is located at 1321 Scott Street. 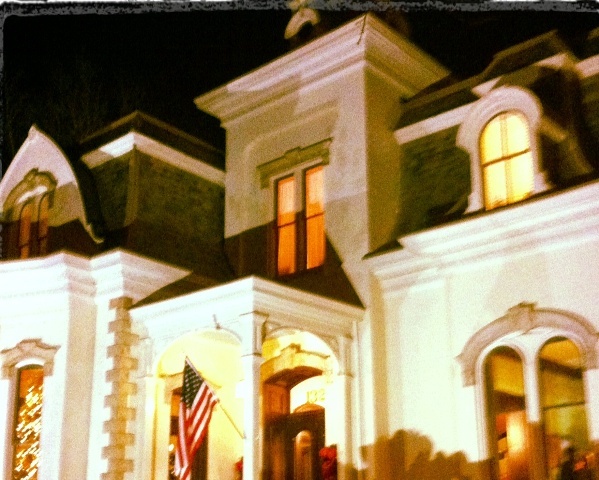 The Second Empire-style Villa Marre was built in 1881 by Italian immigrant and Little Rock saloonkeeper Angelo Marre, who also served on the Little Rock City Council. The distinctive home features a mansard roof covered in patterned slate, a central tower topped by wrought-iron cresting, and hood molding above the doors and windows. Marre died in 1889, and his widow, Jennie, remained in the house until about 1900. Arkansas Governor Jeff Davis rented the house for a few years, and in 1905, the home was purchased by E. B. Kinsworthy, former state senator and attorney general of Arkansas. It is probably most famous today for being the outdoor exterior of Sugarbakers design firm in the CBS sitcom “Designing Women.” For several years, it was the home of the Quapaw Quarter Association. It later returned to a private residence. Currently it is a venue for weddings and other events. It was added to the National Register of Historic Places on June 15, 1970. Today at 12 noon, the Arkansas Historic Preservation Program’s monthly “Sandwiching in History” program will visit the Villa Marre. It is probably most famous today for being the outdoor exterior of Sugarbakers design firm in the CBS sitcom “Designing Women.” For several years, it was the home of the Quapaw Quarter Association. It later returned to a private residence. Currently it is a rentable venue for weddings and other events. The “Sandwiching In History” program is a series of tours that seeks to familiarize people who live and work in central Arkansas with the historic structures and sites around us. The tours take place on Fridays at noon, last less than an hour, and participants are encouraged to bring their lunches so that they can eat while listening to a brief lecture about the property and its history before proceeding on a short tour. A representative from the property is encouraged to attend also and address the group. The tours are organized by the Arkansas Historic Preservation Program, an agency of the Department of Arkansas Heritage. All tours are free and open to the public.